As of this writing this kit is still available at www.heroarts.com while supplies last so if you would like the set hurry on over to purchase. Have you ever needed a bunch of cards quickly? I find in those situations a good cover die can go a long way. There was a wonderful bonus in the April 2018 My Monthly Hero Kit, a full size cover die! And this one is really special. I created several sets of cards and a few singles--31 in total--in one day thanks to this timesaver, and I thought I would share them with you just in case you are ever in need of some quick cards for a gift or charity, to sell or just send out individually. There are 9 different ways I used the die in total. Most of these cards won't be decorated or have a sentiment yet. That way I can customize them later, when I need them. The products used in today's cards were minimal. 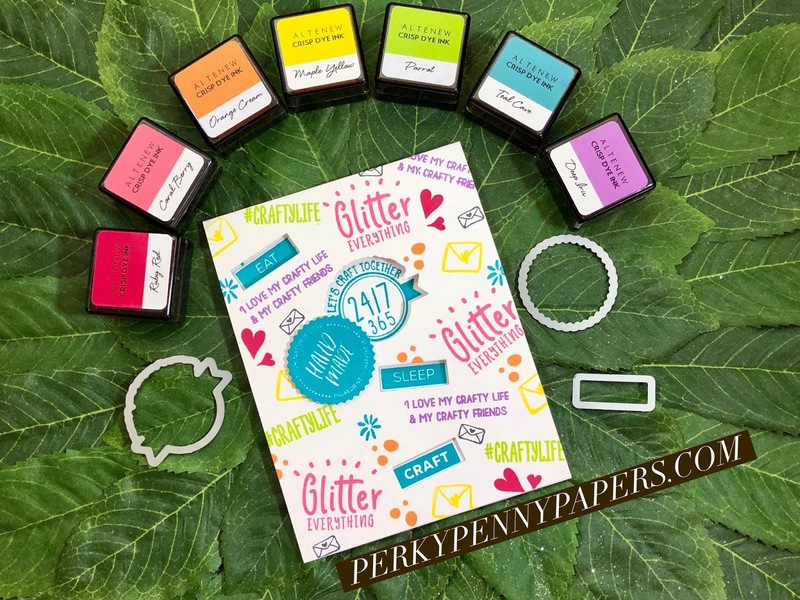 I used the kit, which included a huge, adorable stamp set; coordinating dies for many of the images; the aforementioned cover die; 3 special mini ink cubes in fun fiesta colors; some ribbon; and some pretty handmade papers in purple, green, and turquoise. In addition, I needed scissors, a paper trimmer, liquid glue, and paper (6 colors (pink, orange, yellow, green, blue, and purple) of 8 1/2" x 11" card stock, white card bases, and some gold mirrored paper). Enjoy this video showing how I made the cards. I have included measurements, other ideas and inspiration, and a supplies list below. 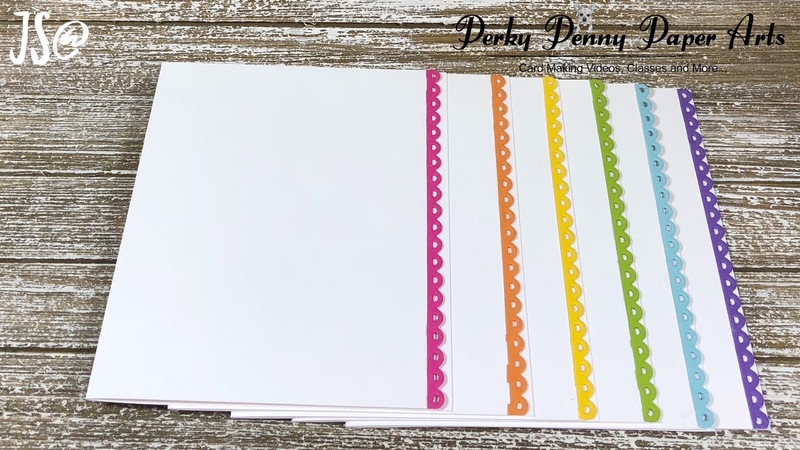 I started by die cutting all of the colored card stock into four 4 1/4" x 5 1/2" pieces and divided them into 4 sets, each with all of the colors. I used the cover die to cut out 2 of the colored stacks and a number of white as well. I think you could just cut this out whenever you have a scrap of paper that fits. I will also be stamping a number of images and storing them with the stamp set so that they are ready to color when I have some time. Those, along with the pre-cut covers, will be wonderful for making quick and easy cards in the future. Way #1 -- This is an A2 sized, vertical, top folding card. The front panel is a 4 1/4" x 5 1/2" piece of Bristol Smooth card stock. I ink blended Salty Ocean and Mowed Lawn Distress Oxide ink to create my outdoor scene. I cut the bottom off my white cover die cut and colored the outside in a brown Copic marker to create a pergola. I colored the flowers in with pink, orange, yellow, and green Copics. 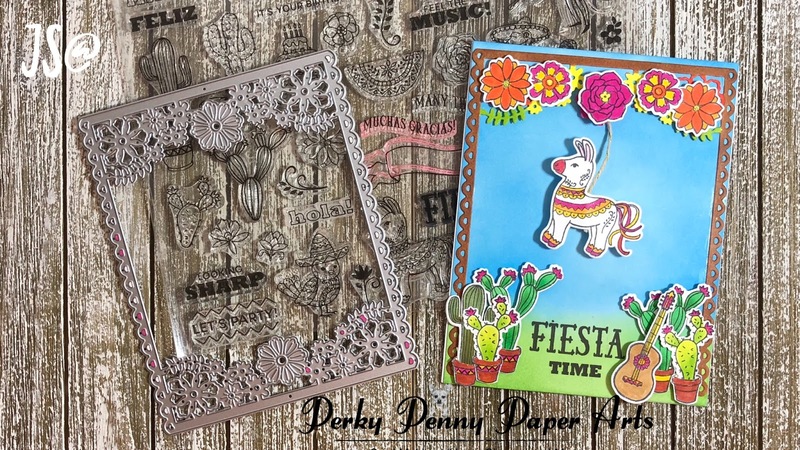 After gluing the pergola to the front of my card, I took Fiesta Time from the stamp set and applied it with Onyx Black Versafine Ink and then some clear embossing powder, which I set with a heat tool. I also stamped and colored the images from the kit stamp set with Copic Markers. I first attached my pinata by using some white and gold hemp cord which I glued behind the pinata and then covered with another die cut. I then glued it to the center flower of my pergola, wrapping it through the hole for some support. I arranged my die cut images and popped them up with foam adhesive. Way #2 -- These are fun mini cards I like to make for a short note or quick thank you. I take a 4 1/4" x 5 1/2" piece of card stock and fold it in half to create my card base. I created a frame with the cover die by cutting it in the middle and then layering the 2 sides on top of each other to fit the space. I also think this would be fun if you used them like this as curtains on a window. To complete the card, I simply attached the pretty frame to the front of my little card. Way #3 -- This is the same size card base as Way #2. In this instance, I folded the die cut in half and attached it over the top of the card so that there are pretty flowers on the front and the back. I think these would make spectacular place cards! 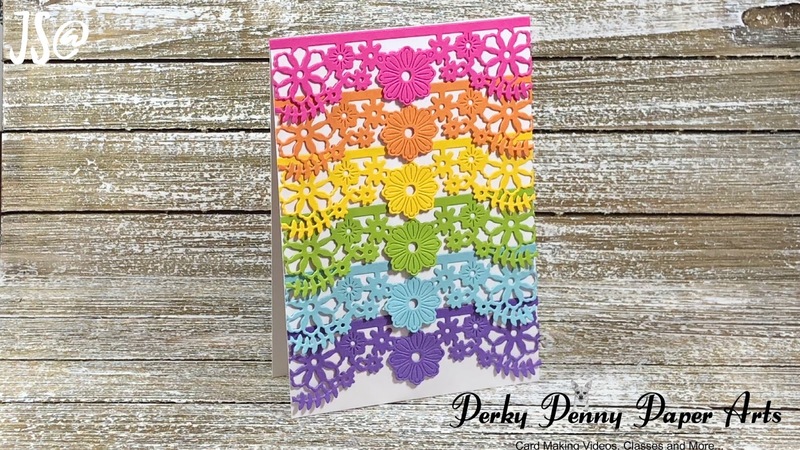 I could also see folding this card inside out to have the prettiness inside as a nice surprise. For these next few cards, I took the cover die cut and cut it down both sides which created 4 separate border pieces. Using these pieces I was able to create 14 different cards, 2 individual and 2 cute sets that would make great gifts. With the exception of Way #5, the card base size for the cards using the flowered border are 3 3/4" x 5 1/2", and the scalloped border are 4 1/4" x 5 1/4". 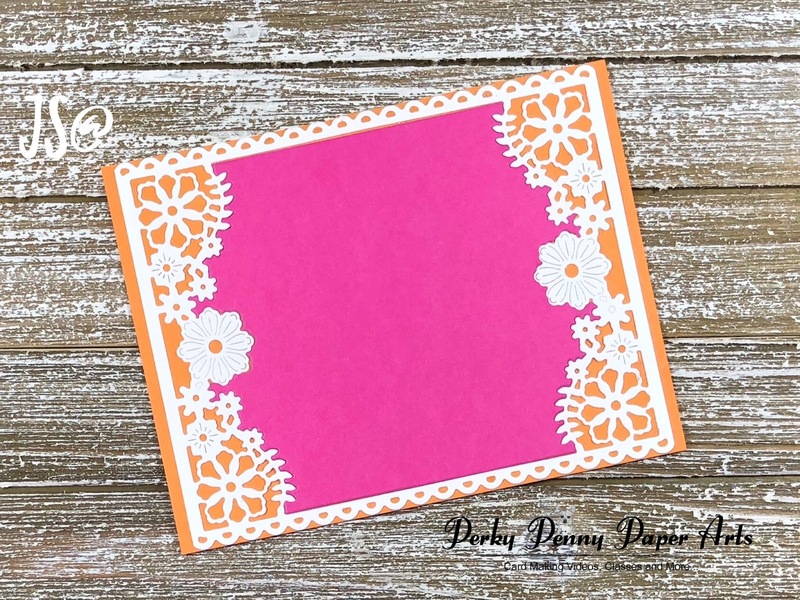 Way #4 -- This card was created by stacking the flowered edge. I only applied glue to the top line of the cut out; that enabled me to tuck the next die cut underneath. This is one of my favorites and I can't wait to try it in plain white. Way #5 -- I trimmed a quarter inch off the front of each of these cards and then ran a thin strip of liquid glue along the edge of the card and applied these cute scalloped edges. I trimmed off any access with my scissors. 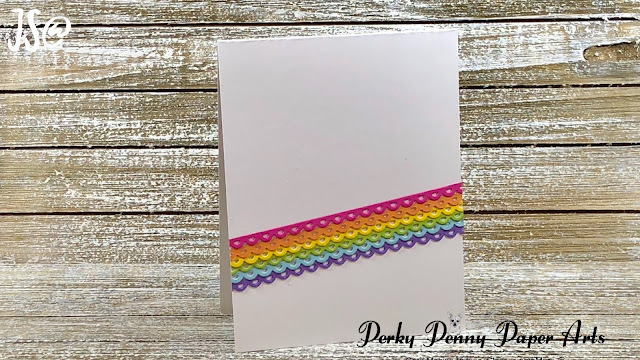 Way #6 -- I took the rainbow of scalloped borders and stacked them diagonally across the page. This could be done in a number of ways. I chose close together. I might cut the bottom part off and put the sentiment on the exposed inside. Another idea would be to adhere a few, stamp a sentiment, and then adhere a few more. Way #7 -- I took these card bases and trimmed off 1 1/4" of the front side of the card. I ran glue along the short edge and attached these pretty borders. Again I can't wait to try this in just plain white; I think it would be beautiful! Way #8 -- I had many center pieces from cutting out all the different colors and thought this would be a fun way to use them. I took a 4 1/4" x 5 1/2" piece of orange card stock and centered and glued the cover die cut in white over it. I chose the pink center piece because I really loved that but I also tried green and yellow and they were equally as pretty. I also think this combination would be fun if the cover die cut was in yellow. Wow, that would pop! Way #9 -- The card base was created by taking a 4 1/" x 11" piece of card stock and scoring it at 2 3/4" from either side. I then folded in the sides and made sure they matched up perfectly before burnishing the folds. I glued one of the cover die cuts into the center of the card and then cut the other one in half. I made sure to round the cut edges nicely and then attached them to the front of the card. I did not put glue behind the center flowers so that I could take ribbon( that was also included in the kit) and run it through one side, wrap it around the back, and run it through the other side. I then lifted the flowers, applied some glue and, after weighting it down with an acrylic block, set it aside to dry. 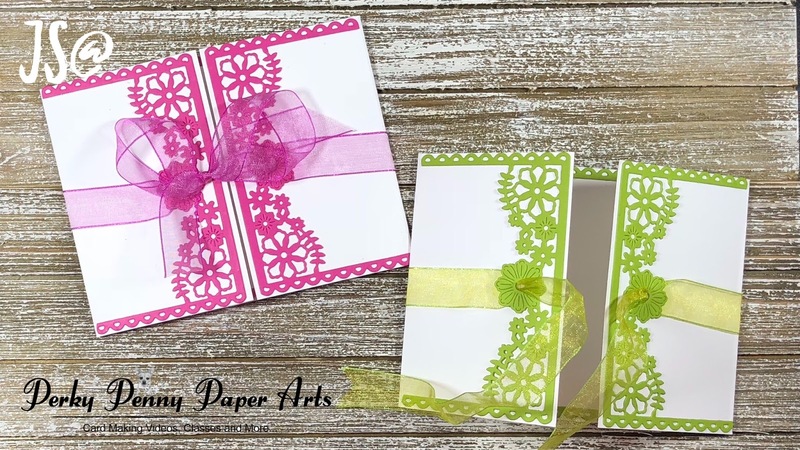 Wouldn't these make beautiful party invitations! And, of course, like any great fashion show I included a stunner at the end. 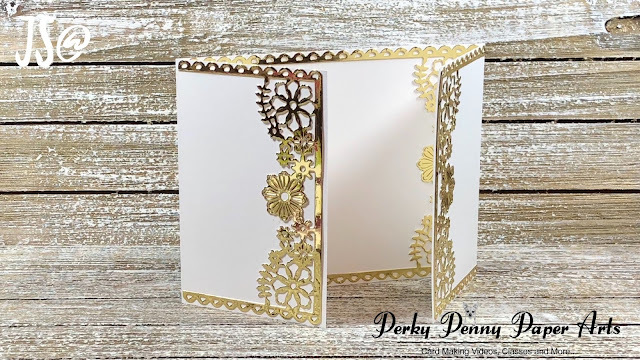 This beautiful gate fold card made by cutting gold mirrored paper with the die. Who doesn't love shiny! And that completes my 31 cards made using this beautiful cover die 9 different ways. I hope you enjoyed it. Please watch the coordinating YouTube video for further instruction. My friends and I love to craft and we love playing with new products so every month I put together a kit and come up with 5 projects for everyone to create together. 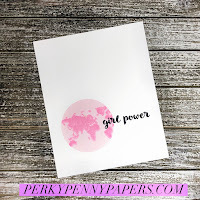 The papers from this month's kit are so pretty I thought it would be fun to share the kit and projects with you today. I called the kit Isn’t She Lovely as it is filled with pretty things to make Mother’s Day or birthday cards for the special women or girls in your life. Here is a YouTube Live I filmed constructing these cards. Check it out and then read below for measurements and a shopping list. The paper I chose this month is the Hello line from Doodlebug Design. I included three coordinating Doodle Pops; they're mini sets of multilayered embellishment stickers. To stamp, I chose the awesome You Are My Most Favorite stamp from Neat and Tangled which would make a great card stamped alone on a card. 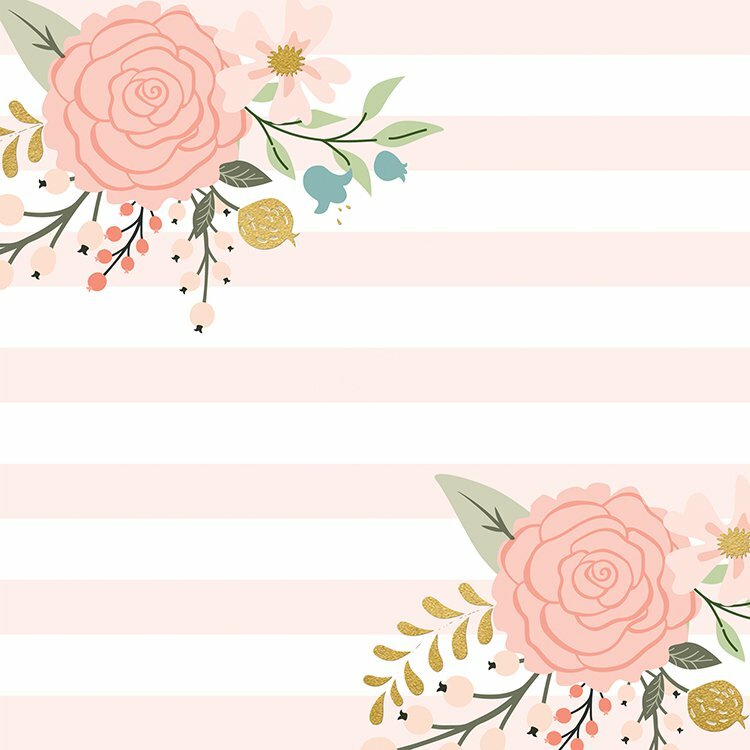 I included this set of adorable puffy stickers with great gold accents and some pink chevron washi tape that matches the Hello line. I thought the Spellbinders Birthday Garland Die set was the perfect fit. I really like how the garland and the birthday dies can be used separately or together and the fun little shapes would make cool confetti. 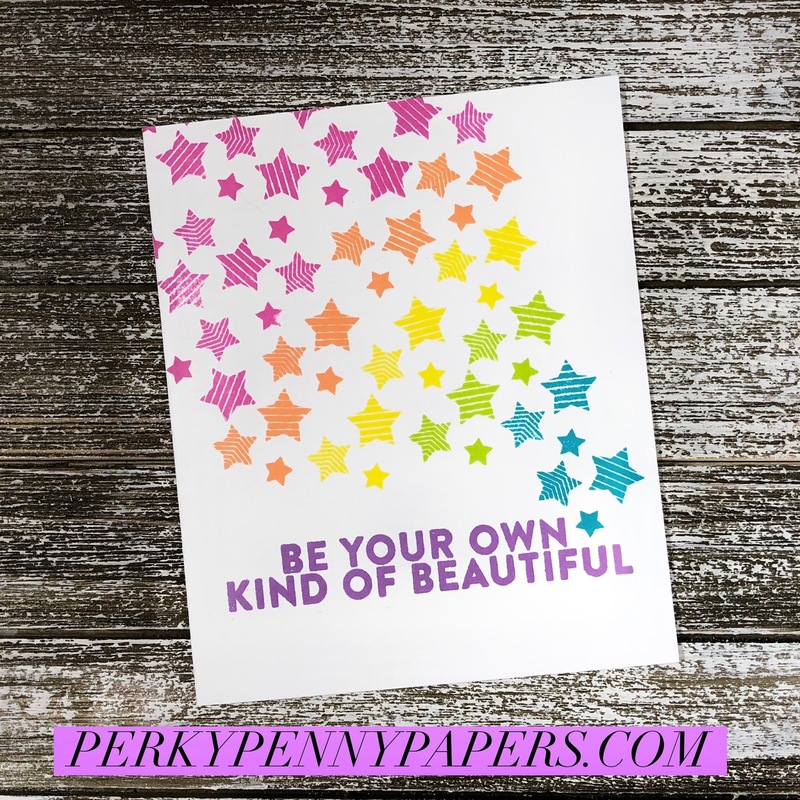 Last, but not least, we have 24 designs of beautiful papers--some more simple, and some bright and lively. Gold foil is included on several of the patterns. The paper is just gorgeous! The front of this first card is pictured above. 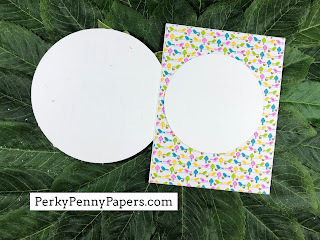 I created a base for using a 4 1/4” x 5 1/2” card panel and a folded A2 card base which I cut a round card base out of using an approximately 4" circle die. I placed the die over the folded edge and ran it through my die cutter which allowed for an uncut edge which created the card base. I then attached in to the flat panel on the edge and attached a 4 1/4” x 5 1/2” piece of patterned paper to hide the back of the circle. 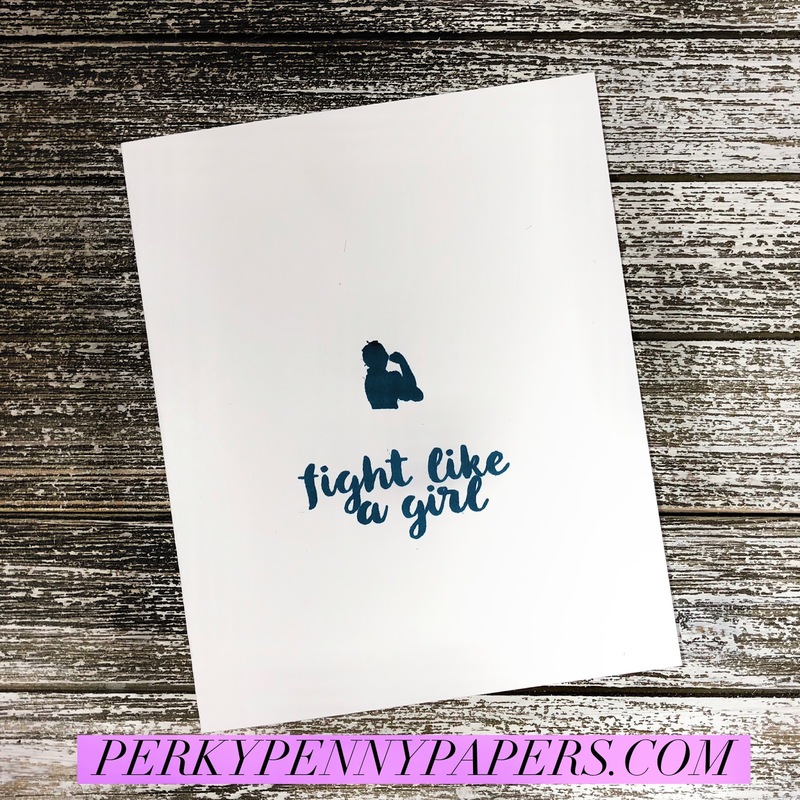 I then lined and stamped the sentiment on the outside of the card and embellished it with a bow and later some of the Doodle Pop Embellishments. The finishing touch was a circle placed under the front of the card to provide a place for the giver to write on (cut out during the creation of card 5). 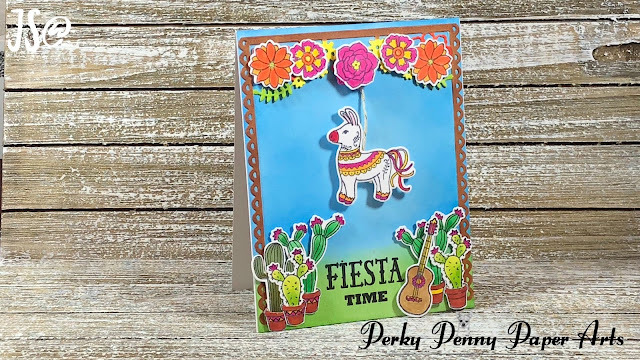 This card was created using the Lawn Fawn Pivot Pop-Up Die. It is a top folding A2 card base. I decorated the front with 2 panels that are 2” x 3 1/2” each. I rounded the corner and attached them with tape runner before decorating with the washi tape and the globe hello sticker. The inside is embellished with a 4” x 5 1/4” piece of patterned paper on the top plus some washi and mini journaling cards from the paper pad. This is a quick and simple card design. It includes a 3” x 6” panel on the front, surrounded by a sliver of the paper used to cut out the Happy Birthday die at the top for balance, the garland and flowers cut from some of the patterned papers, and a few of the puffy stickers for fun accents. I attached all the items accordingly and card 2 is done. This new to me card design is called the Impossible Card. It is created using 1 piece of paper which creates an illusion of needing more. I took a 4 1/4” x 5 1/2” panel and scored down the middle, at 2 1/8” on the short side. One side is cut to the center score line at 2 3/4.” The opposite side was cut 1” from each of the sides to the center score line. Watch my video to learn how to fold this card as it is somewhat difficult to describe. You have to see it to believe it. After the fold was created, I decorated the card using 2 strips that are 1 3/4” x 5 1/4”, for the “floor” of the card; and two 3 3/8” x 1 7/8” pieces of patterned paper for the front and back* of the pop-up segment of the card; a white square that fit the sentiment I chose; and some of the Doodle Pop embellishments. (*In the future, I won’t include the back piece because I think it weighs down the pop-up piece slightly.) I attached everything with tape runner and card 4 is complete. Last but not least, we have a 6” square card. I LOVE this size and always try to include one. I took two pieces of the patterned paper. The one I chose for the border was cut to 5 3/4” square and the top layer was cut to 5 1/2” square. I centered the top piece over the bottom piece and used tape runner to attach them together (avoiding the center area where the circle frame will be cut out). I centered the largest of the Lawn Fawn Stitched Circle Frame dies on the front of these 2 pieces and ran it through the die cutter. I set aside my circle frame and the round center. I then centered the patterned papers and attached them to the card base, after which I attached the die once again and cut out a window to the inside of the card. I saved the white frame for another project and used the circle to attach inside of the first card. I stamped and die cut one of the Happy’s from the Lawn Fawn Happy Happy Happy Stamp set and cut it out with the coordinating die. I used Copic Markers in matching colors to color in the Happy. The birthday die is a mystery. Not sure where it came from but it was perfect for the card so I decided to use it. I die cut the Happy, Birthday, and circle frame using fun foam so that I could pop these pieces up inside the window of my card. I glued the paper and matching foam pieces together. I trimmed some of the foam from the B and the Y in birthday so it would lay flush with the frame. After attaching all the pieces to the card, I embellished the front with several gold sequins and called it a day. I’m really happy with how these all turned out and can’t wait until next month. The theme is: It’s All About Him … . Had some fun ink blending with a stencil today and such a pretty one at that. This card was inspired by the Easy Ink Blending Techniques class at Altenew Academy. It was a great class, check it out if you want to learn some new tips and tricks :) Several techniques are discussed, from creating your own matching card stock to faux watercoloring. Here is a quick video of the process I describe below. 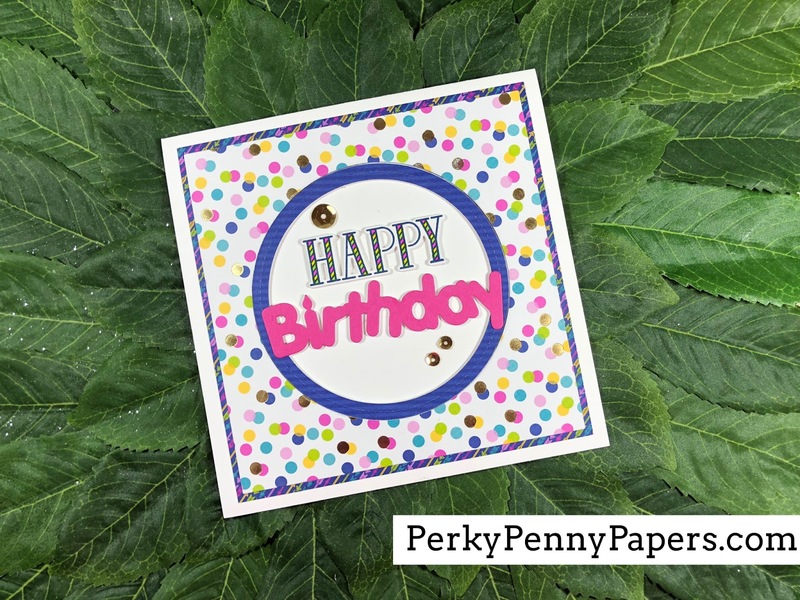 I was able to create this card using the Leaf Burst Stencil from Altenew. I blended Wild Honey Distress Ink in the center and Picked Raspberry Distress Ink on the outer leaves. To take it up a notch, I turned the stencil (so that the tall leaves overlapped the short leaves) and blended the Spiced Marmalade Distress Ink onto the page. I was careful to use sticky notes on the open areas around the square so I had this pretty pattern only on the page. I created a matching pink border by inking the edge of a 6" square piece of white card stock with the Picked Raspberry Distress Ink. 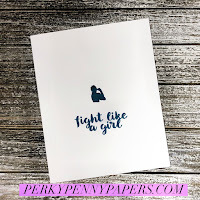 I stamped the sentiment from Altenew's Thoughts & Reminders stamp set, in Versafine Onyx Black Ink, and used Altenew clear embossing powder to create some shine and make the saying pop off the page. To complete the card, I sandwiched a piece of 5 5/8" black card stock between my stamped panel and my pink panel and then attached it all to a 6" square card base. To complete my card, I added sequins in coordinating colors. 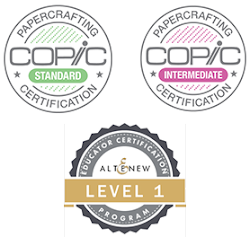 This is my next project in the Altenew Educators Certification Program. It corresponds with Lesson 3 of the Irresistible Inking Techniques Class which focuses on stamp block inking which is a super easy, fun technique that creates a beautiful frame focal point on your cards. It works wonderfully with one layer cards but today I decided to cut out and create some interest and dimension on my card. I really wanted to play with the stunning Budding Thanks set that I have had for a while and had yet to open. I am hooked. Like all of Altenew's layering flower stamps, these are so fun to stamp. I started by die cutting the flowers out first and then placing the die cut back into the negative space on my MISTI. This made it a breeze to line up the stamps and create multiples in no time at all. All of the colors I used are in the supplies list below. I am going to keep the negative space for future use which will make it even easier in the future. I plan on die cutting a number of these flowers and leaves to take on vacation with inks, stamps and MISTI to create flowers to have on hand for future card needs. I love fun little projects like this so I can enjoy my hobby on the road without needing bulky machines etc.. I created my 2 background pieces by inking up a 3" x 4" Acrylic block. The bottom one is Pink Diamond, and top is Dew Drop. After I had plenty of ink on the block, I spritzed the block twice from about 10" above, flipped the block over onto my paper, and pressed down firmly as though there were a stamp on it. I gave each piece time to dry and then cut out the rectangle and rounded the top left and bottom right corners for added interest. I attached the pink piece directly to an A2 card base and then popped the blue piece up with foam tape. I die cut the "hello" from Altenew's Floral Arrangement Die set in shiny, gold, mirror paper from Bazzill. I then created my arrangement and adhered everything down. I popped up the flowers with foam tape as well and then finished off the card with some droplets from Pretty Pink Posh. Check out my first YouTube live where I talk about making these cards. Forgive me I was really nervous :) It's not perfect but I will learn. Watch at your own risk! Please, please, please comment if you have any problems or suggestions. I love the flight trail stamps included in this stamp set. 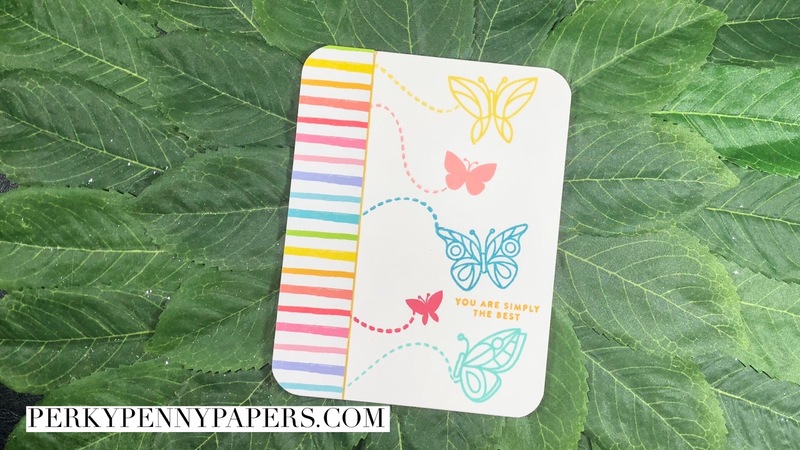 I thought it would be fun to play by combining them and this fun watercolor striped paper to create this card. I matched up the colors with inks I have. I cut a strip of the patterned paper and then held it to the card front while I positioned where I wanted to stamp. I then removed it before stamping. At the end of the flight trail I stamped a matching butterfly, alternating between patterned and solid butterflies. When I was done stamping I attached the patterned paper to the front of the card lining it up over the flight trails. I then ran a line of gold gel pen along the edge of the patterned paper to create an interesting transition between it and the white paper. I stamped the sentiment and rounded the corners with a corner rounder and the card is complete. Who doesn't love a beautiful blue sky!?! This was an experiment of applying Prisma Color Pencil first, then blending it out with a blending pencil and then going over it with a BG000 Copic Marker. I'm pretty happy with how this background turned out. Before I created the blue sky I randomly stamped the leaf branch on a 4 1/4" x 5 1/2" panel, alternating between the left and right side. Using YG03, YG06 and YG09 I colored each of the leaves section by section. First the lightest color, then the darkest in the bottom corner, and then the medium about a third to a halfway up the section and then the lightest all over it again to blend it. When I was done with all the leaves I randomly colored over some with the Y06 marker to create some extra interest because no 2 leaves are ever alike. 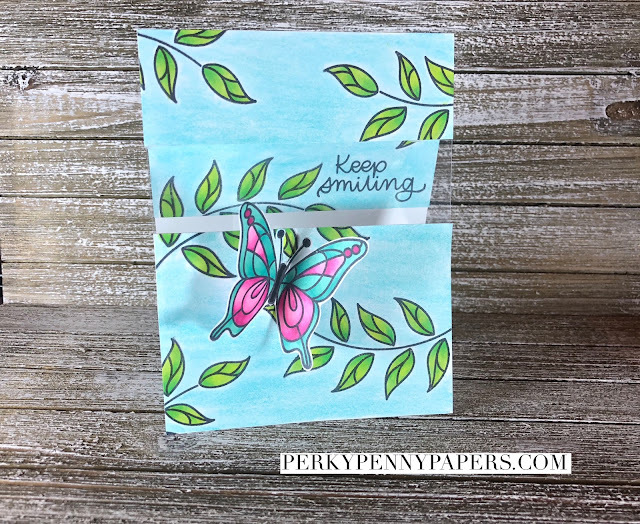 My butterfly was colored using the same technique as the leaves but in BG32, BG34, and BG13 for the blues and RV02, RV04, and RV09 for the Pinks. I cut my colored panel into 3 pieces. Cutting right below and right above the sentiment. This center, sentiment panel will be attached to the inside of the card. To create the window I took a the top colored panel, lined it up with the top fold, and drew a line across the front of the card base. I then cut the front on this line. The next step was to attach a 4 1/4" x 5 1/2" piece of acetate to the front of the card base by applying Nuvo Deluxe Adhesive to the top remaining section and then lining up the acetate with the top fold. Some of the glue was then put on the back of the top colored panel and it was adhered over the top or the acetate. I took the piece of card stock I had left from cutting the front panel, and created another panel the same size as the bottom section of the colored panel. I then attached the white panel on the back of the acetate at the bottom and the colored panel on the front. Finally I opened the card and lay it flat inside up. I put the center, sentiment panel over the clear acetate facing down and put tape runner over the back. I then folded the back towards the front and pressed down so that the sentiment would be stuck to the inside panel and show through the window. Tone on tone coloring and masking to the max were the order of the day to create this A2 sized, almost one layer card. I used the Post It Notes that have sticky all over the back to create three masks of each stamp by stamping on the top Post It Note and then removing the two below it as well. I then cut out all 3 at the same time to speed up the process. I will also be saving them for future projects so it was well worth the time it took me. I started by preparing a 4 1/4" x 5 1/2" panel. The colors I used are Guava, Lavender Field, Lemonade, Carrot, Celery Stick, and Merman from Lawn Fawn. I stamped three of each butterfly starting with the largest and masked off after each was stamped. I then took the leaves and stamped them to fill in some of the white spaces. I then took a Tombow Blending marker, and starting with the lightest color I dipped the marker on the ink pad and colored in the butterflies in the matching ink, going darker and darker until everything was colored in. The sentiment is from the stamp set and was heat embossed on a piece of vellum using Ranger Ultra Fine Gold Embossing Powder. I cut a banner end and adhered it to the front of the card by putting Nuvo Deluxe Adhesive behind the words. The completed panel was then attached to the front of an A2 sized card base. I created this card by taking this rainbow patterned paper and cutting it in half both ways. This gave me four 3" squares which I then cut in half on the diagonal. I took 4 of the squares to create my square by matching them up in the middle and then adhering them to the front of an A2 card using my tape runner. I cut a 1 1/4" square of white card stock which was just big enough for the "I adore you" sentiment, which I stamped in Onyx Black Versafine Ink. I popped my little cube up using 3M Foam Tape. 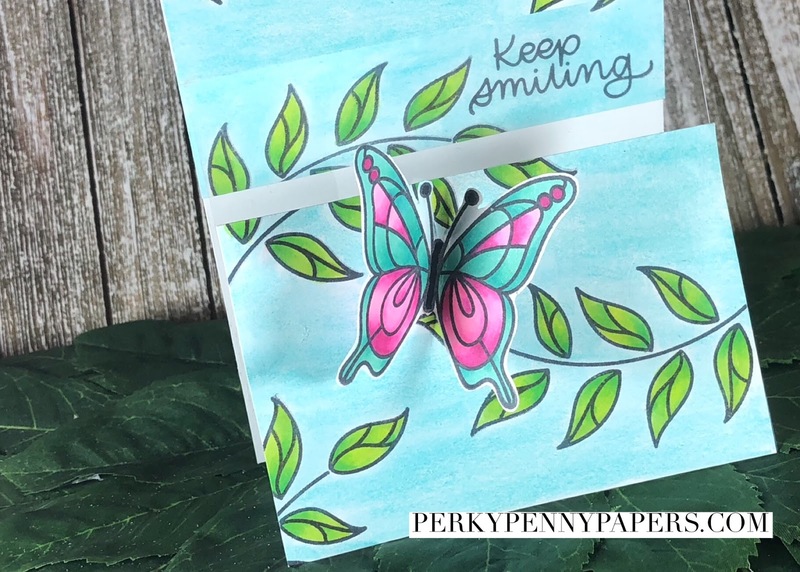 To create my pretty little butterflies I chose the stamp I wanted to use and stamped the butterfly on the remaining triangles. I lined the paper up with the card first and then stamped the butterfly so that the lines would coordinate with my rainbow square. This gives the illusion that the butterflies are jumping off the page from the pattern. I colored in the body with black ballpoint pen, fussy cut them, and then glued them down in the center with my Nuvo Deluxe Adhesive. I popped up the sides of my butterflies to create some really cool dimension. The last step was to stamp the adorable "You Are Simply The Best" stamp from the set. I really love these tiny sentiments. 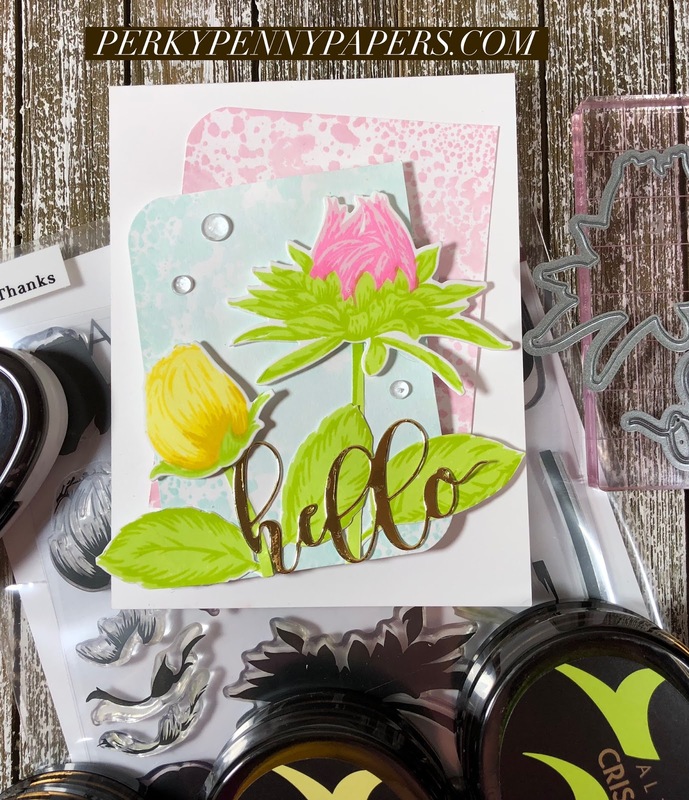 This card is stenciled by using the stencil, Distress Blending Brush, and the 2 pretty Distress Oxide colors included in the kit, Squeezed Lemonade and Mermaid Lagoon. I'm kind of lazy when it comes to stenciling so I just hold the stencil down and cover up any spots I don't want to color through with Post It Notes. I colored with each of the colors alone and then combined them to create the green. Using black card stock scraps, I die cut the Thanks die from the Big Thanks set, from Simon Says Stamp, and glued them together to create a dimensional sentiment for my card. After adhering it I punched out 3 butterflies using the Tim Holtz Small Butterfly Punch and attached them and some sequins to the front of my card for added interest and dimension. 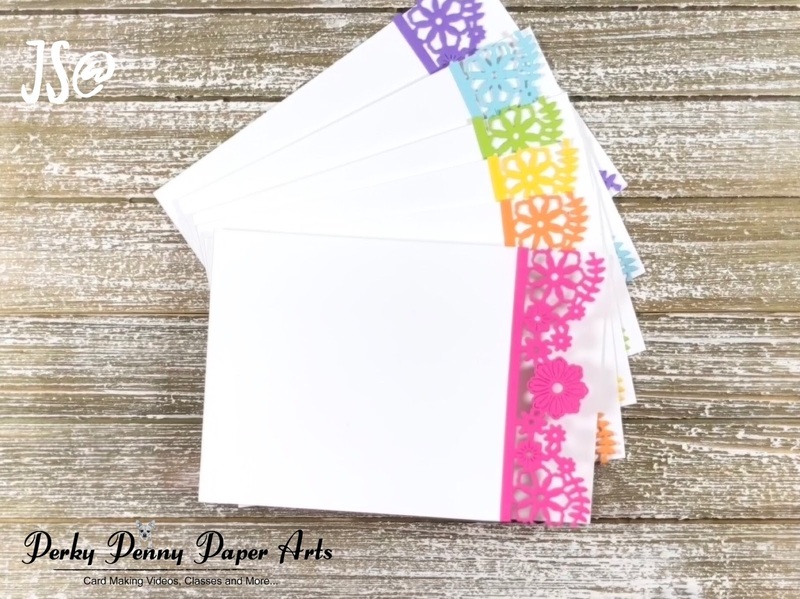 And there you have it 5 pretty cards created using the April 2018 Simon Says Stamp card kit. 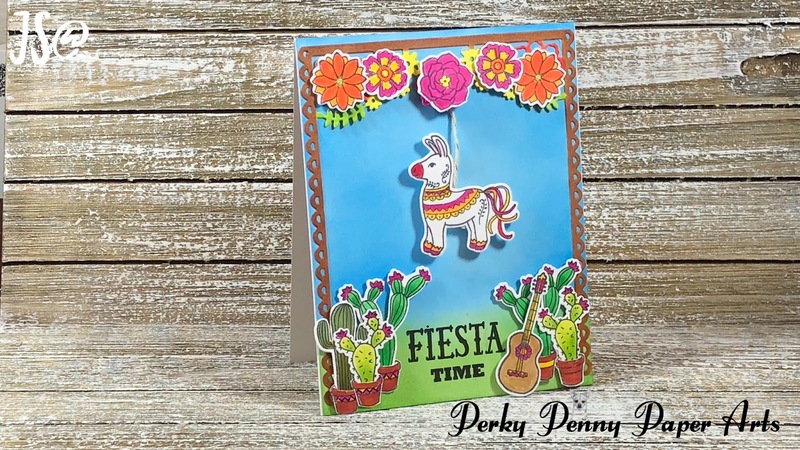 I hope you are feeling inspired and even if you don't have the kit, have some fun and make some cards. 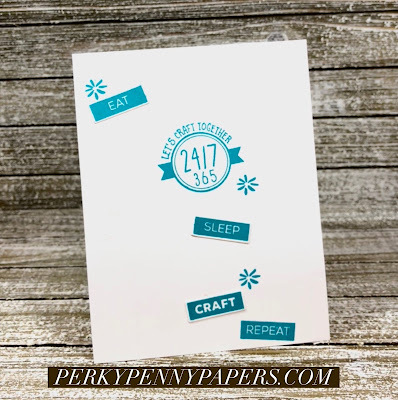 The Crafty Life and Crafty Friend Stamp set from Altenew have a wonderful array of fun sentiments to play with and make cards for all those crafty people in my life. This card was inspired from a window card in the Altenew Academy Class Seasonal Scene Building. I'm channeling rainbows today. Some bright and vibrant colors from Altenew. Check the supply list below for more information. I stamped a combination of images from both sets to create the outside of my card and then die cut the images I had dies for. On a seperate sheet I die cut the Hand Made label and die cut it to pop up on the front of the card with foam tape. I used my Nuvo Deluxe Adhesive to glue the die cut pieces to the inside of the card, through the spaces created by the dies. I then added the word repeat and several floral images inside to add a little more fun when the recipient opens the card. 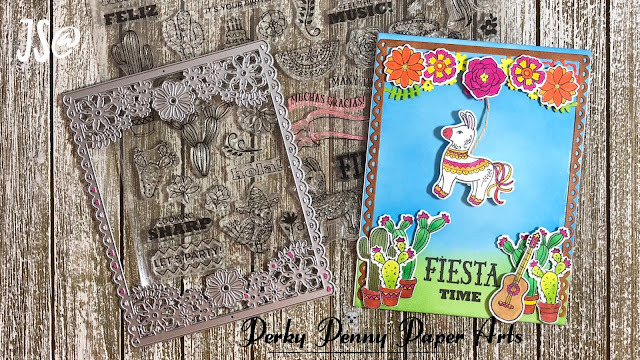 I created these cards for the event using several Hero Arts and Altenew stamps sets that I have listed below and a variety of inks from these wonderful companies as well. The cards are simple one layered stamped pieces that I was making at the event. This allowed people to pick the colors they wanted etc. I had so much fun and highly recommend it if you have the opportunity. I love seeing the reaction when I am stamping away. Hopefully I have inspired some future card makers as well. 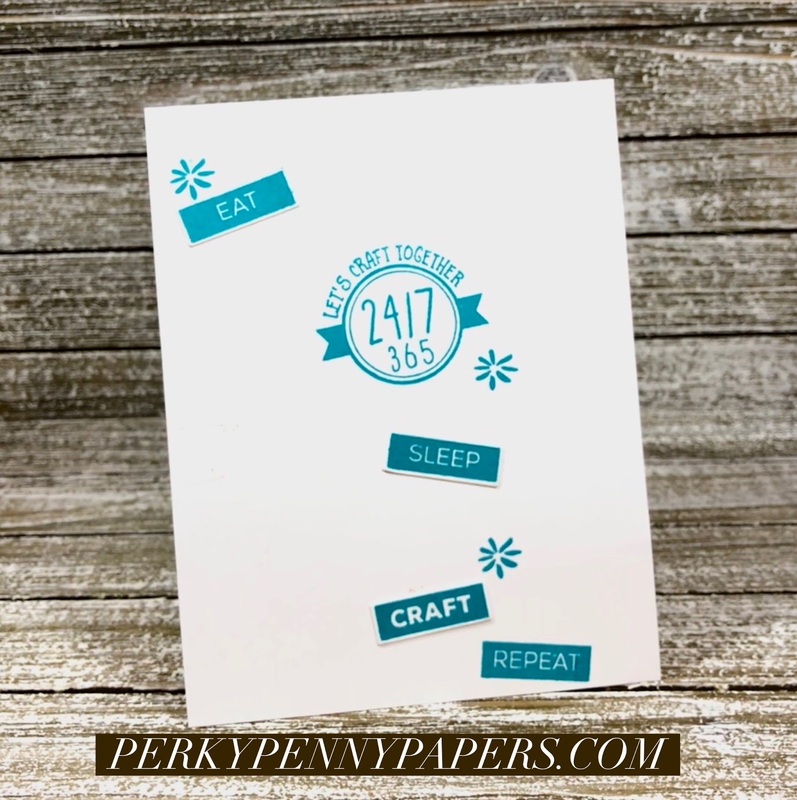 • Hero Arts Clear Stamps, Hello Gorgeous! Today I am creating some fun cards for the guys in my life. With guy cards I try to keep it quick and simple. No fuss, no muss! Most that I know won't appreciate the extra effort unfortunately. That doesn't mean that I can't have fun though. It is a great time to try some new techniques. Today I am going to focus on Stamp Kissing. I created 2 cards to give you some ideas of how to use this technique. 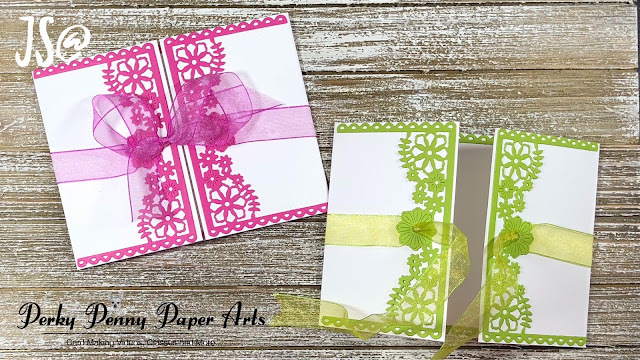 Check out this video to see how to create these cards yourself. This first card is a true one layered card. We start with a piece of 4 1/4" x 11" 110lb Neenah Solar White card stock folded to create a top folding card. 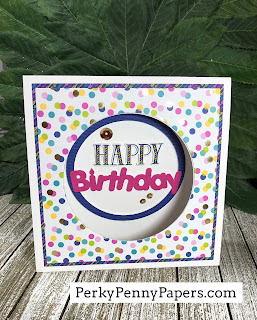 Stamp the first balloon in the light color using the MISTI stamping tool. Next, leaving the stamp on the MISTI, take the patterned stamp, put it on an appropriately sized block and cover it with the darker ink. Kiss this stamp onto the balloon stamp that is still in position in the MISTI and quickly close the door stamping the patterned image onto the card. Repeat this with each of the balloons on the card. The exact colors are listed in the Supplies list below. For the sentiment I stamped it in the center, towards the bottom of the card and then finished the card by drawing strings from the balloons through the sentiment to the bottom of the card. 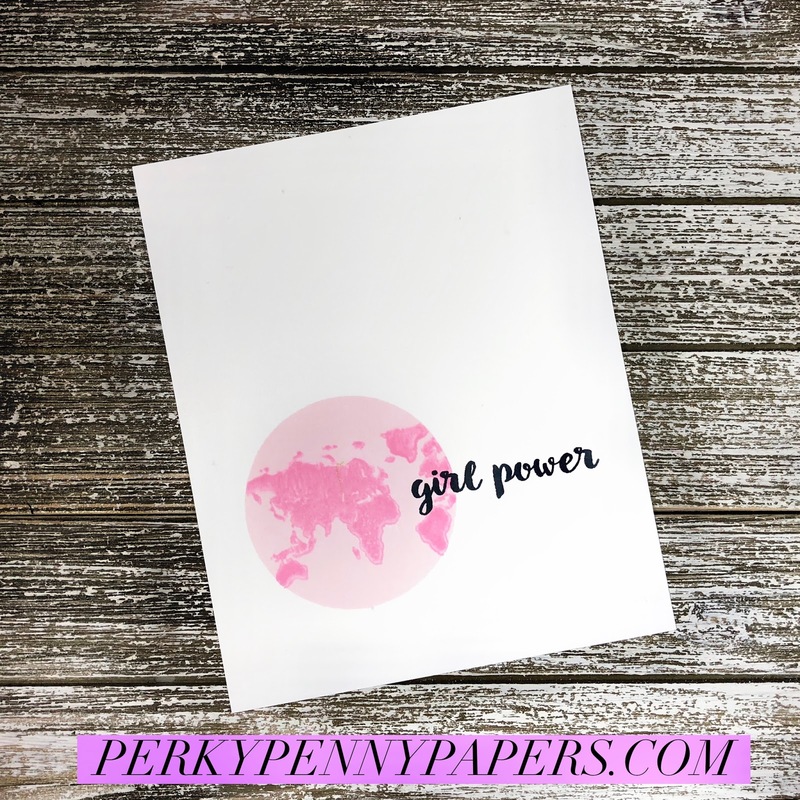 To create this next card I placed a 4 1/4" x 5 1/2" panel of 110lb Neenah Solar White card stock into my MISTI and a 3/4" x 5 1/2" of the same type of card stock on top, half an inch up from the bottom. I will stamp, and pop up one of the sentiments here. I then place the elephant in the location I want and align the sentiments around the elephant (One on the strip of paper and one up by the elephants trunk). Using Altenew Pure Granite, I stamped both of the sentiments. I took the strip of paper and ran the same ink color along the top and bottom edges so that it would create a frame for the strip. I popped the sentiment up with foam tape and secured it to my card. The elephant was created with the same kiss technique from the first card. I used the matching die to cut out the elephant and placed foam tape behind it on top and where the trunk is. I put some tape runner glue on the section that would be on the sentiment strip and adhered my elephant to the front of the card. I then attached the panel to a top folding, horizontal A2 card base. To create today's card I was inspired by the beautiful papers of the Bliss collection by My Mind's Eye. 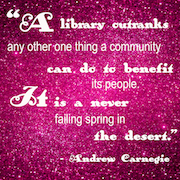 It has beautifully subtle colors with gold foil accents. I chose to play with two different papers from the pack. 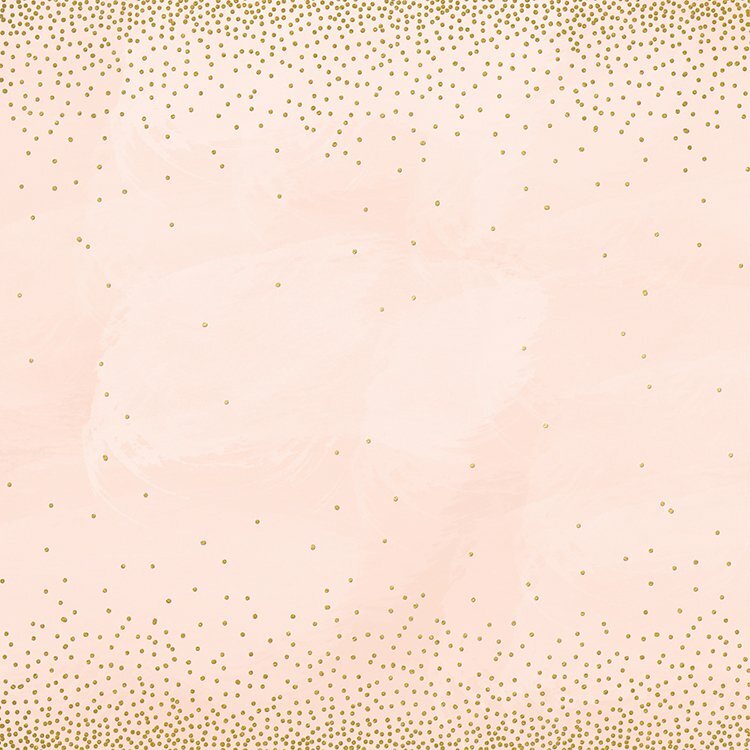 One was a whimsical pattern with sweet little gold foil dots raining up and down on the page. 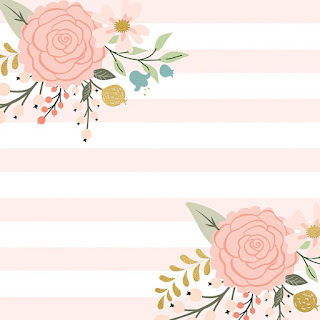 The other was a wonderful pink and white striped pattern with a lovely arrangement of flowers in the corner. 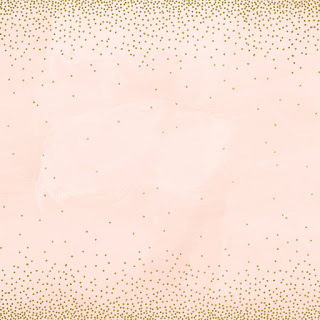 I created a simple A2 sized card base and attached a 4 1/4" x 5 1/2"cut piece of the little gold dots paper. I cut carefully making sure I was left with a nice frame to sit behind the decorated panel I was going to make. The striped piece had flowers in opposite corners so I had to strategically cut a 3 3/4" x 5" piece out of one corner where the flowers were in the bottom left. This meant I would be able to use the other flower arrangement to make a second card. I stamped and embossed the Celebrate sentiment from the tiny Altenew Celebrate stamp set and then continued on to create the flower. I created my dimensional flower piece with the Fantasy Floral Die 3D die set. I cut the bottom and top piece from white card stock and color matched Altenew Inks to the colors in the paper pack. I applied the inks directly to paper to create these 2 pieces. The middle piece was cut out of a piece of gold metallic paper. I assembled the flower using foam in between the layers to create dimension and adhered it to the card covering up the flower that was on the paper. I used the remaining paper to adhere the striped piece to, as I had cut the center flower piece out of the center, and trimmed the edges to leave a very small border of gold around the edge. I often do this to use as much of the gold paper as possible. I have several other pieces I cut out of the piece that I can use on future projects.